If you like to take pictures in RAW image format, Good News! The next feature update of Windows 10 will natively support those image formats by using a store-delivered RAW Codec Package, which is currently in beta stage. Microsoft released a new Windows 10 insiders preview build 18323. If you are a Windows Insider in the Fast Ring, you can try it right way. The latest version of Windows 10 (19H1) build 18323 does not include many new features like the previous builds, but it includes few improvements and moving towards the release which may start rolling out to mainstream users in April 2019. Windows 10 Insiders Preview Build 18323 from the 19H1 branch adds improved RAW image format support natively in Windows. 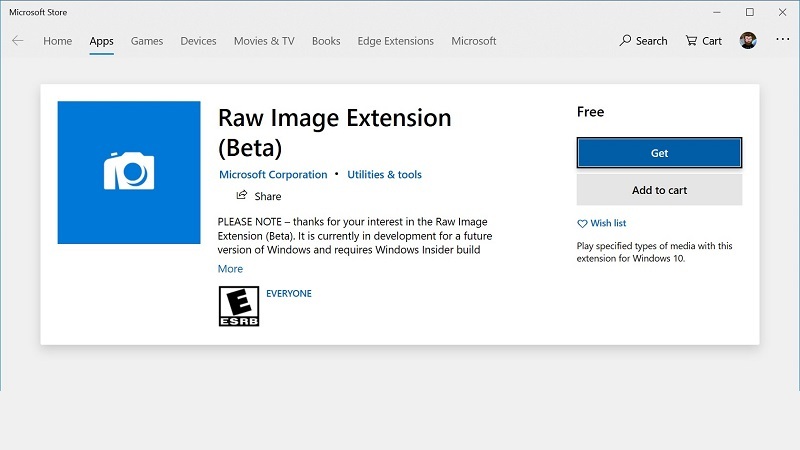 To view image thumbnails, previews and camera metadata of previously unsupported raw files in File Explorer, you need to download the Raw Image Extension (Beta) package from the store. This will also help you to view those raw images in full resolution. The build also includes improved version of the Light Theme that was first introduced with Windows 10 Insiders Preview Build 18282. The latest test build also includes numerous other fixes and improvements that pushing it towards the next public feature release. If you have come this far, it means that you liked what you are reading (Latest Windows 10 build 18323 (19H1) adds improved RAW image support).